Recently, my family and I discovered a wonderful website, BibleGateway.com. We had just finished our family devotional, Our 24 Family Ways, and were wondering which study to do next. That's when I learned about BibleGateway.com. BibleGateway.com offers free audio Bibles in a variety of translations. You can also choose from three different readers: George W. Sarris, Max McLean, or Dramatized. This dramatized version of the Bible helps my children to create images in their minds concerning what they're listening to. Hearing the different voices of each character assists them in better understanding the dialogue. Also, they are learning the correct pronunciations of individual names and places. We have had wonderful discussions following each chapter we listen to (and sometimes in the middle of the chapter as well). This has worked very well for our family because we are listening to God's word together. 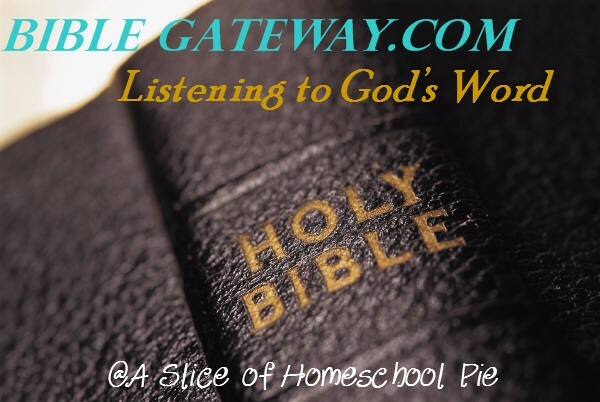 If you're seeking a new family Bible study, consider BibleGateway.com's audio Bible. Are any of you currently listening to the audio Bible through this website? Thanks for this awesome resource! I didn't know about. Hi Kayla! You're welcomed! I was hoping it would bless someone. :-) Let me know how you enjoy it.